Android OS is an open source mobile operating system owned by Google and developed by the Android developer community. 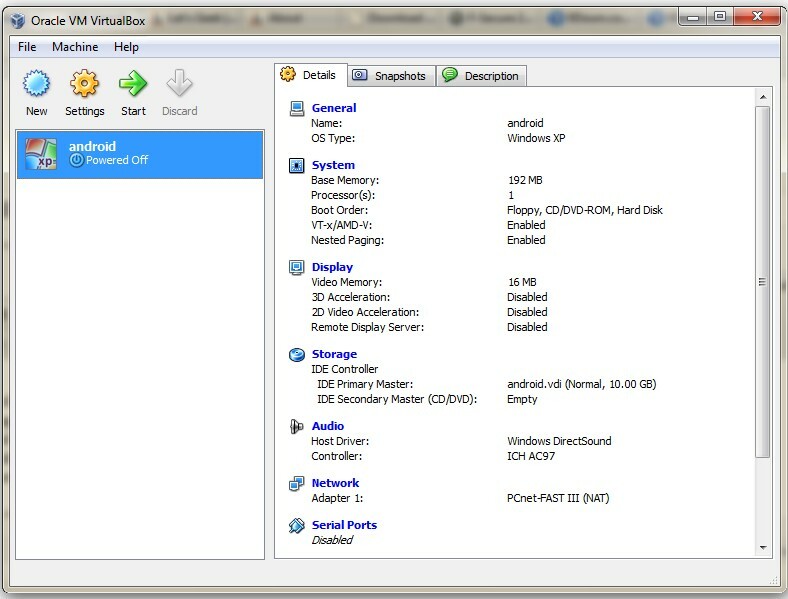 Android is based on Linux, and it is widely used in mobile phones, and also waiting for its entry into tablets and netbook computer segment. 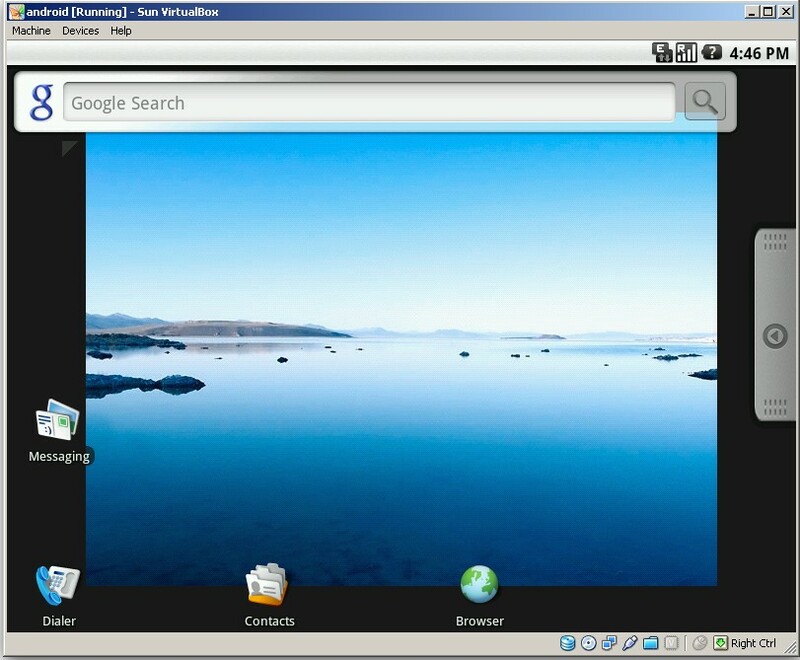 Though it is a mobile OS, we can virtually run Android on Linux, Intel Mac and even in Windows. Live Android is a special compilation of Android OS in a CD ISO image form, that we can use to boot Android from a USB drive or CD. 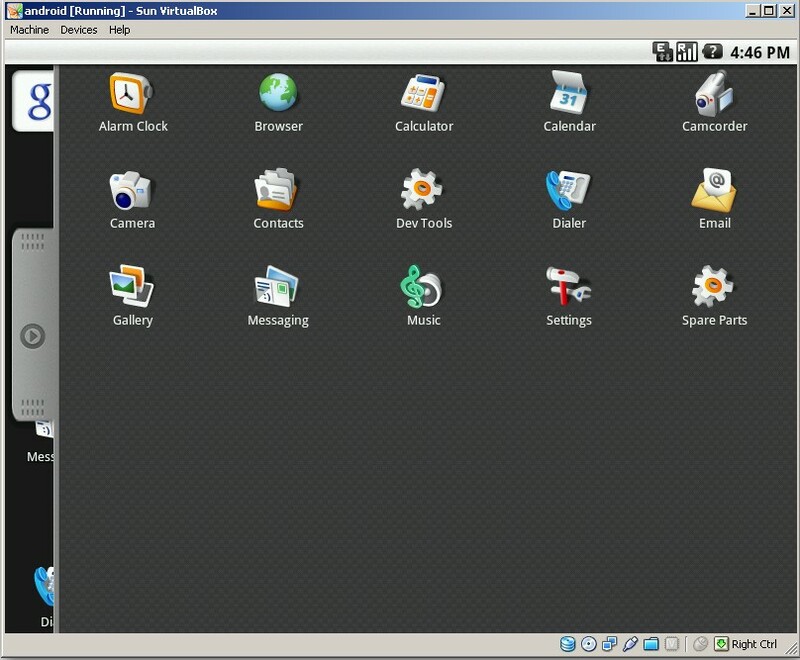 We can also use a desktop vitalization application like SUN VirtualBox and install (virtually) or operate Android OS in Windows and other OS platforms. Though we cannot exactly reproduce and use Android just like as in mobile phones, give it a try if you are planning to buy an Android device or curious to know about its user interface, menu options, etc. Here we will point you to the Live Android download, and help you to install Android OS in Windows, virtually using SUN VirtualBox application. Download Android Live CD here. Credits: Live Android and Google Code. Download the 3rd(.001) and 4th(.002) links, and join the two files with HJsplit for Windows. 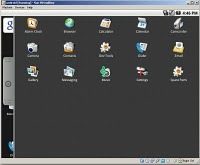 Now download and install SUN (Now Oracle) VirtualBox for Windows from here. After installation, Open VirtualBox and click on create new virtual machine . 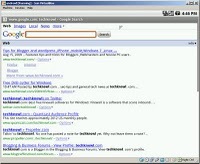 Enter the name as Android and Operating system choice as Windows XP, Windows Vista or Windows 7. In all upcoming steps, click next after competing with all the required instructions given below. From radio buttons, create new hard disk. Select Dynamically expanding storage . Now click Finish to create a new Android VirtualBox. 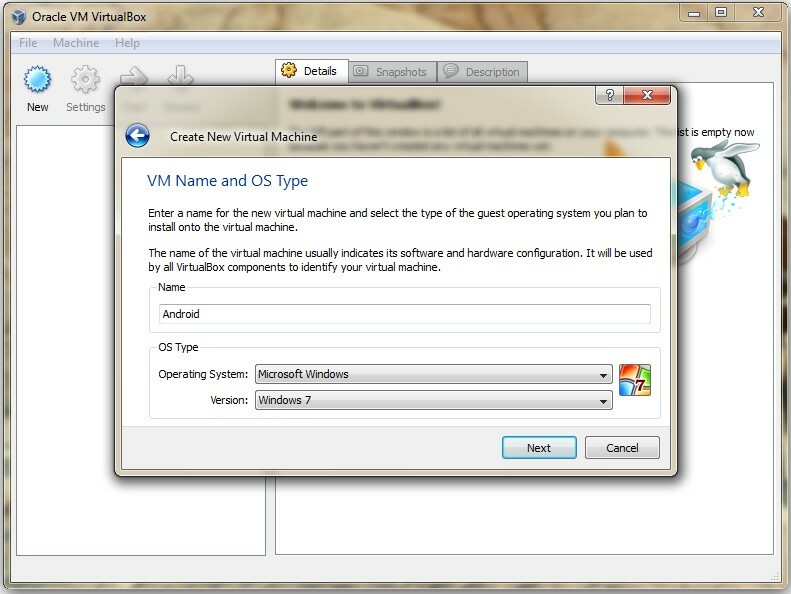 Now from VirtualBox interface select Android and click start . In next step, select media source as image and browse to the location of the joined Live Android .ISO image . Let the wizard complete. It will open the the Android OS home (given below) after execution. When we click mouse anywhere, it will pop-up a box- click capture and continue. 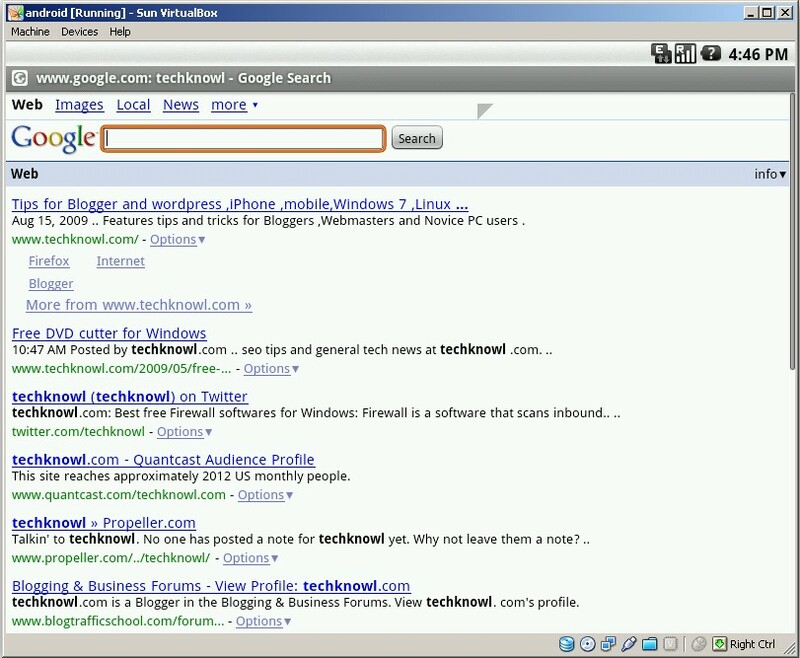 Techknowl in Android web browser- virtually installed on Windows (click to enlarge ). with corresponding devices given in that page; however, you could use the same ISO files to create bootable USB disks (using Unetbootin ). Follow the procedure given in the Unetbootin website to build a Live, Android USB disk. If you just want to run popular Android apps on your Windows or Mac (limited compatibility) desktop, try Bluestacks. Where can I find how to config GRUB2 for booting Android from hard-disk? How can I install apps? I tried to download from andriod market but I got cannot read package error. Thanks for the directions… I think I’ve gotten it done. So, space scrolls down. Escape is “back”. What’s “home”? How do we update? How do we install apps? Oh,thank you for helping us to install Android, that were very good directives. Is there any similar way to install symbian or any other Mobile OS on PC? ভাই ল্যাপটপের জন্য কোন অ্যানড্রয়েড ওএস কি নাই ?? I was able to install the Android. But when I boot the android OS, I get this error “Please connect charger”, with mouse I am not able to click on “OK” button neither does space or enter or shift or any keyboard functions help me. How to cancel this error? is it exactly operating system like windows? This is a waste of time, Humans like always ruin a good thing. What it is the point of this OS, it won’t work. It doe not pull the grub, it does not update?